Warmer weather is finally on its way! If you’d like to increase your time outside this season, now is a great time to think about building an outdoor living space. Here are some ideas on how you can make the most of the great outdoors. From hosting barbecues, to bird watching and stargazing, to container gardening—a deck provides many ways to enjoy the great outdoors. “Today, there are many affordable options when it comes to building a deck. And so you can make the most of your time outside, we will customize your design according to how you plan to use it,” explains Alyssa Mendez, Project Manager at Cormack Construction. Bonus: A deck addition can recuperate as much as three quarters of your investment for the value of your home. A porch gives you the open air of a deck with the added benefit of shade and shelter. A little drizzle won’t stop you from making use of this addition, and it’s a prime spot to catch a good sun-shower. If you want to go an extra step further, add screening to keep out troublesome insects. You’ll still get to savor the fresh outdoor air, while keeping your budget relatively low. If you prefer to admire the great outdoors from the comfort inside your home, a sunroom could be the perfect fit for you. 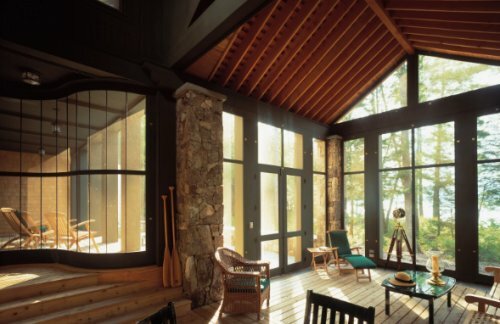 With proper insulation, a sunroom can offer the same level of climate control you’d expect from any other part of your home, allowing you to enjoy the seasons year-round without even stepping foot outside. Even the lower-cost alternative of a three-season room can set you up nicely to appreciate the warmer and more moderate months of the year with the same sense of comfort and privacy as a four-season design. Last but not least, a balcony can offer a sense of luxury with a fairly small footprint. A balcony provides an ideal spot for some secluded outdoor reading, or a warm evening nightcap. If you’re looking to get your dose of the outdoors in a more private setting, a balcony may be the perfect addition for your home. RELATED: Tips on planning your outdoor living space. Cormack Construction is ready to help you make your outdoor oasis a reality. If you’re looking to make a comfortable, beautiful addition to your home that will help you get the most out of the seasons to come, contact us to schedule an appointment.